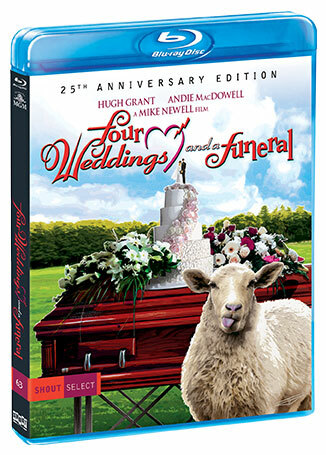 On February 12, the irresistible 1994 romantic comedy Four Weddings and a Funeral celebrates its silver anniversary with Four Weddings And A Funeral (25th Anniversary Edition), a spectacular Blu-ray™ release from Shout Select. A new 4K scan and a new interview with the Director of Photography are among the many special features on the release. The champagne is flowing — and so is the fun — in this “delightful and sly” (Roger Ebert) tale of true love, unrequited love, and love at first sight. Charlie (Hugh Grant, Bridget Jones’s Diary) is a charming bachelor and frequent best man at the string of weddings he attends with his friends. Carrie (Andie MacDowell, Groundhog Day) is an enchanting American who catches his eye just as she is about to marry the wrong man. With a sparkling screenplay from Richard Curtis (Love Actually) and an outstanding ensemble cast, including Kristin Scott Thomas (The English Patient), and Rowan Atkinson (Bean), Four Weddings And A Funeral is a delightfully engaging occasion!